Unique and Special Gifts for all your loved ones! Paula began pottery in Calgary, Alberta while working on a Bachelor or Science in Biological Sciences at the University of Calgary. She continued doing pottery on-and-off while working for various environmental consulting companies. Since Paula grew up in the Okanagan, she had always planned to return to BC and the land of many beautiful lakes. 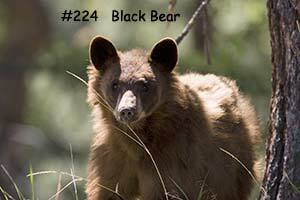 So, when the opportunity presented itself, she packed up and settled in West Kelowna with her husband and their Belgian Shepherd, Jem. Paula is a member of the Potters Addict studio where she taught the pottery wheel classes for 9 years, and where she creates her own pottery to sell. Paula spends a lot of her time outdoors hiking and sailing, which at times are the inspiration for her pottery pieces. I started Scrapbooking over 15 years ago which evolved into Card making about 4 years ago. I love knowing that something I’ve created will bring a smile to someone’s face and I try to create a variety of styles from simple to humorous with no two cards ever the being the same. I’ve been commissioned to make personalized cards and invitations. I am always exploring new crafty techniques and projects and those can be found on my Facebook page or at several local craft fair events. Jessie is a budding Kelowna artist, originally from Gabriola, BC. She has always been involved in the arts and pulls inspiration from the many beautiful floral landscapes throughout the Okanagan and Vancouver area. Jessie graduated as a Visual Arts Major from Langley Fine Arts School in 2014, and from that has phased through many different mediums to create art. In 2016, Jessie started painting on glass with Alkyd based paints and resin to create colourful, three-dimensional pieces of art. Her work continues to grow with every painting, constantly experimenting and enjoying the process. We met Mari at a market in Okanagan Falls and loved her Solar Garden Ornaments that she has made, some of them have “bobble heads” and are very cute! A wonderful experience .We have always been creative so this is the next chapter. Countless hours of beach combing has resulted in finding many treasures at low tide. Locally Designed Artwork by Alex Fong and others made into Beautiful puzzles to challenge you! Beautiful locally handcrafted wood serving trays, cutting boards and candle holders by Artisan Lee White. I just arrived from Spain 2 years ago to Canada and it has been the best change in my life. I started to paint when I was 10 years old and since then it has been my passion. Unfortunately I could not make it my career due to several circumstances but as soon as I was retired I decided to follow what I really love doing. Since I arrived to Canada I have been painting non stop. Something here is giving me the inspiration and the willing to find new ways of mixing paints. Experimenting has been my goal for almost a year now and I think I am getting better and better every day. 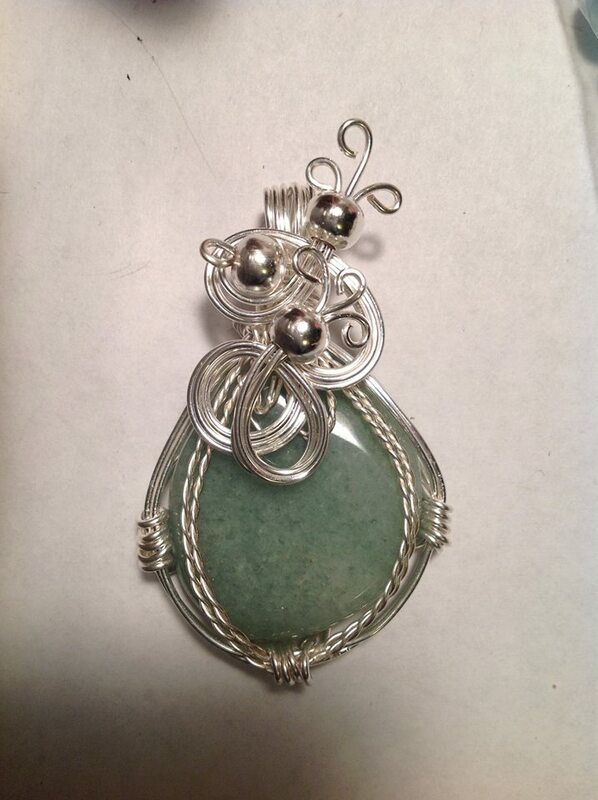 I am working as well in jewelry, pottery and creating some different abstracts that pop into my mind when I see something around me that can be done differently. I hope you will enjoy my work and at least have a smile on your face when you see them. Jim Brompton is the number 1 Canadian Landscape Photographer. 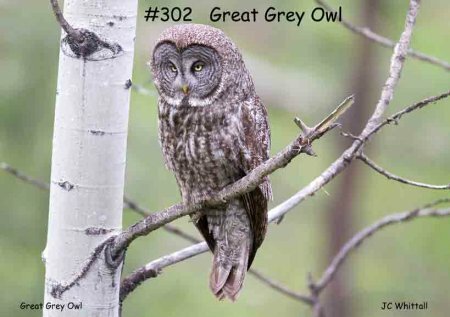 Jim has had many images and articles published from his trips in National Geographic and most recently has been featured in the Outdoor Photography Canada Magazine. Jim is known as a master of understanding light and creates Art that displays incredible depth and detail. Jim is also considered an international artist as he travels the world to capture his breathtaking and stunning images. We are very honoured to have his art work in our store. We have both matted photos as well as canvas prints on display. Janet does beautiful hand made glass bead jewelery with sterling silver findings and makes bracelets as well as earrings…drop by our store and view these one of a kind pieces of art! We met Joe and Isabel at the Kelowna Art Walk, we immediately fell in love with their truly unique and beautiful art pieces, as well as this charming and delightful couple. Joe does the woodwork and Isabel does the ceramic pieces. From large pieces to small they do it all with much love and care built in every piece they do. We truly thank them for joining our gift shop of over 30 local Artisans. Joe and Isabel’s artwork has been in many Art competitions throughout the Okanagan Valley and Phoenix Arizona. Norbert Spyth retired in Kelowna in 1997 he is 81 years old and after being an engineer and Die & Tool maker decided to keep busy by creating these beautiful pieces of art. Norbert read books most of his life such as history of early mosaics,architecture,metal arts and stained glass art. His art education is self taught and his experience comes from trial and error. Starting out with stained glass designs of his own design, but soon was working on mosaics using left over glass. His art glass works are rendered in two and three dimentional pieces. Norbert’s work has been commisioned in several residential installations. He has become a juried artist since 2006 in Lake Country Art Walk. In 2010 Norbert Spyth has learned the art of Scratchboard in black and white or coloured with inks. Norbert has done many pet portraits,flowers and landscapes in this medium. 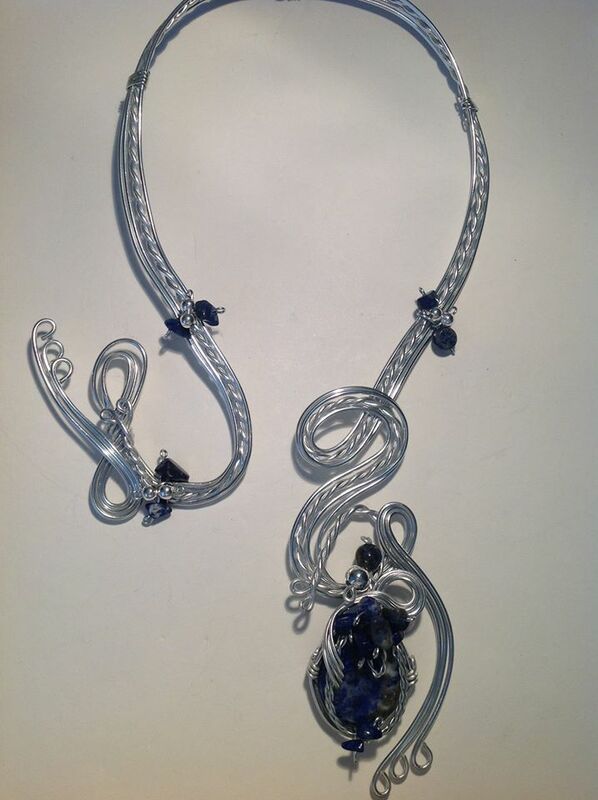 Glenmore Gift Gallery is very happy to have his beautiful pieces in our gift store! We at Glenmore Gift Gallery are very excited and honoured to have artist Wade Baker , Crystal Meditation Candles and stunning crystal Sun Catchers, in our gift shop. They are both beautiful items to have and give as a gift. Wade Baker is a world renowned Native artist from North Vancouver. Thank you Wade for joining our team of over 30 local Artisans! We are very pleased to have Gary and Dorothy join our ever growing list of Artisans here in our store. Their functional Ware/Dinner Ware is very beautiful and a true piece of unique functional artwork! teachers, parents and students in ways to make B.C. schools as successful an experience as possible for everyone. Since their retirements in 2012 they have been developing their skills in working with glass, drawing on their extensive experiences working with people, teaching and travelling, to create art! Through their company, Glass Root Creations, they are designing, developing and producing stained and fused glass art, glass and wood sculptures, glass tableware and fused glass jewelry. They believe that life inspires art… it certainly has for them… and that art inspires life… and it is that desire to inspire others through art that drives them to hone their skills and provide art that people can take into their lives! 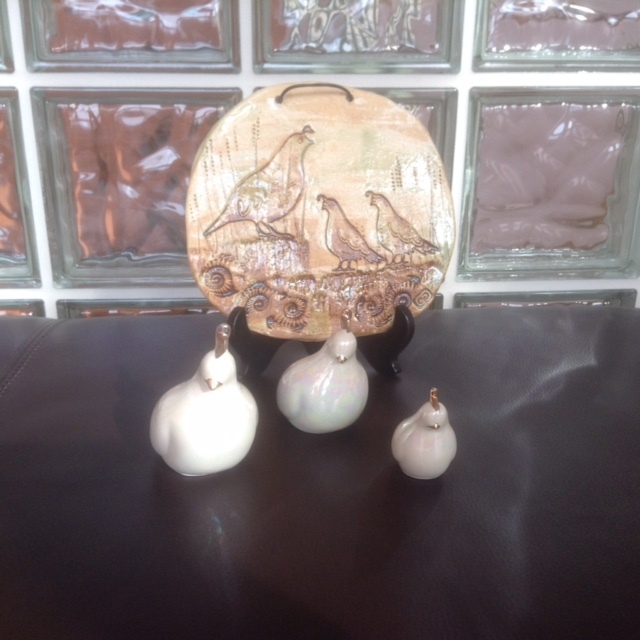 Attainable art began in 2000, Yvonne has always been fascinated by pottery and all the methods used to create it. The technique of hand-building allows her to take advantage of the clays ability to capture gesture and movement, and the unplanned occurrences that happen in the raku kiln reflect the warmth and spirit of the occasion. She enjoys the rhythm of a potters life where the work never stops and each piece created goes out into the lives of those who chose them, leaving her with feelings of deep gratitude! Born on the Prairies of rural Alberta, Rhéa’s journey as an artist began at an early age. Creating beauty and purpose from a myriad of objects, whether lost or found were always her pleasure. Her mother’s famous words: “Don’t throw that out, you can make something outta that” have sunk deep within her and served her well in the world of art. Rhéa incorporates many textures and color in her work. 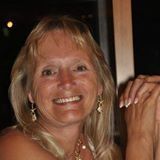 Whether working on Encaustic, mixed media, smashed tile mosaics, funky shoes, acrylic, oils or watercolors, she is sure to create a treasure while keeping the earth green. Being a Creative Soul, she believes her creativity is a gift, not to be kept to one’s self, but to be shared with others. She loves to encourage the artist in others and brings hope to the world through the arts. Career Highlights  Guest Artist – The Bay – Orchard Park Mall, Kelowna, BC  Guest Artist – 3 African Kings – University of Calgary, Calgary, Alberta  Guest Artist – Nunavet  Founding Member of Airdrie 7, Airdrie, Alberta  Curator – Royal Sproule Art Gallery, Rosebud, Alberta  Guest Artist – Unless Market & Kelowna Art Gallery, Kelowna, BC  Founding Member of Airdrie Regional Arts Society, Airdrie, Alberta Rhéa’s work can be found in private collections of African Kings, Artic Mayors as well as in Canada, U.S.A., Germany, Mexico, Africa and many other parts of the world. 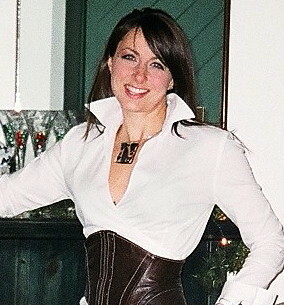 She is a graduate of the University of Calgary with a Fine Arts Degree. Her career in international human resources and raising her children took priority over painting until recently and we are pleased to have a few pieces of her work at our gift gallery. We discovered Kelly Fraser while attending an art show and loved her creativity and unique talents in painted glassware. We are pleased to have her join our family of Artisans in our gift store! Her heron vase was inspired by the heron rookery located behind her home in Cowichan Bay and won an award at an art show. Kelly paints bright, colourful designs on all matter of glassware, from wine glasses to vases and more. B-Line design is a husband and wife partnership, creating wrought iron object for the home and garden. Our designs and creations are representative of our way of life, fun, functional and adventuresome. 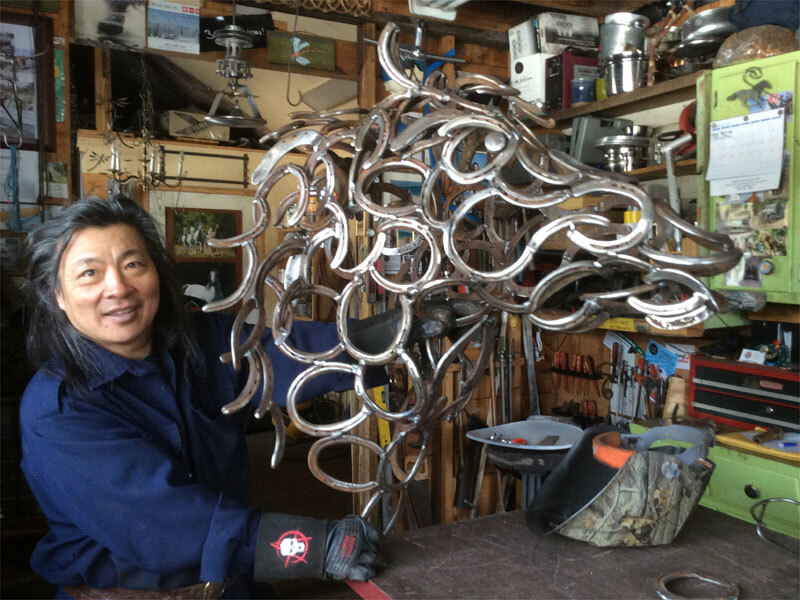 Finding in 1998 that the area of metal artwork intrigued Mark most, Bettina and Mark moved to the country in 1998, searching for a less stressful and meaningful lifestyle. In this new peaceful environment both create functional, fun and unique objects for the house and garden. 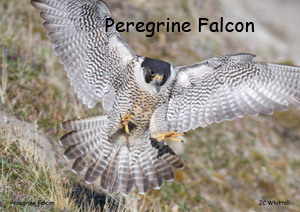 Their work has been shown in Vancouver, the Okanagan Valley, Calgary, Edmonton and Saskatoon. Participating in art sales they have been successful in maintaining an artist lifestyle with their unique creations. Thank you Mark and Bettina for joining us we are excited to have your beautiful and creative work in our gift shop! 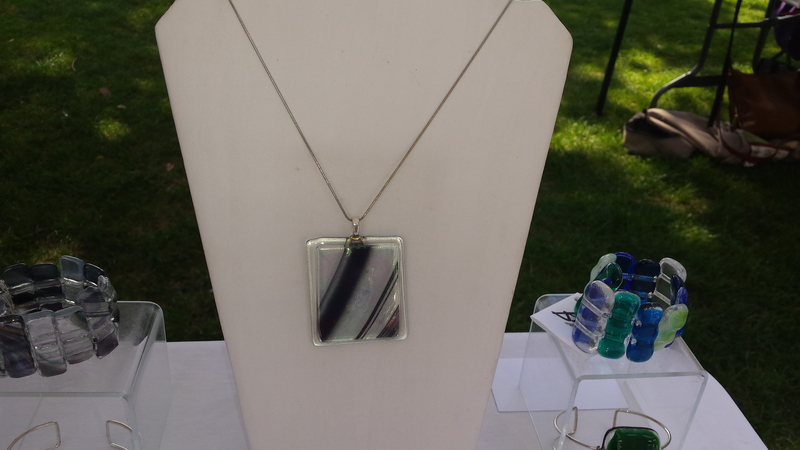 We met Bahia Laham at an open Market in Peachland and were very impressed with her artistic designs in glass and metal infused Jewellery. 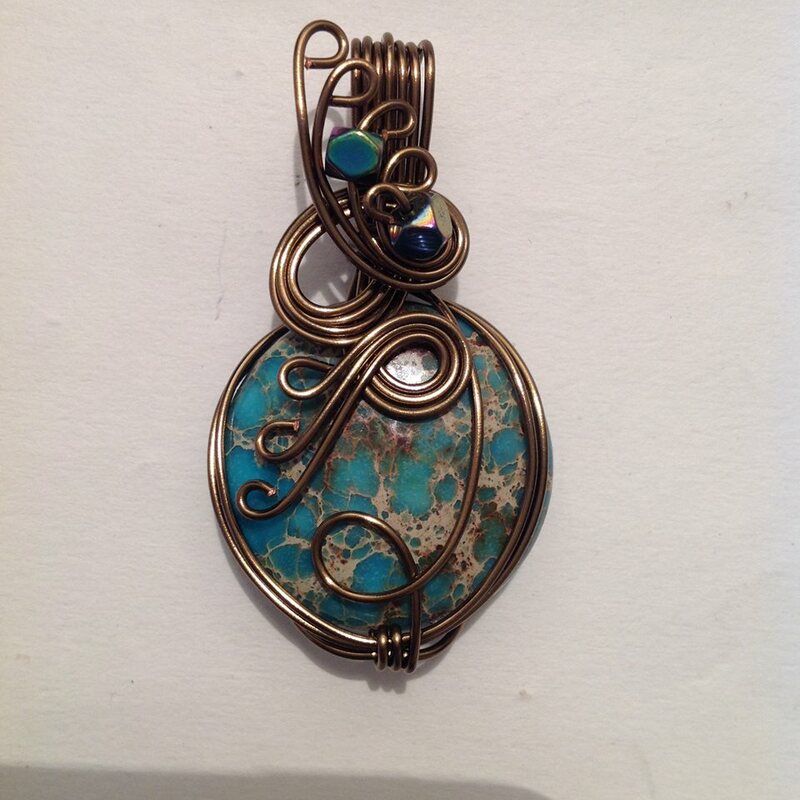 Her dream is to restart her line of jewellery here in the Okanagan Valley. She was inspired by our business concept of offering unique one of a kind gifts and has graciously accepted Glenmore Gift Gallery as the location to jump start her career. Thanks Bahia! 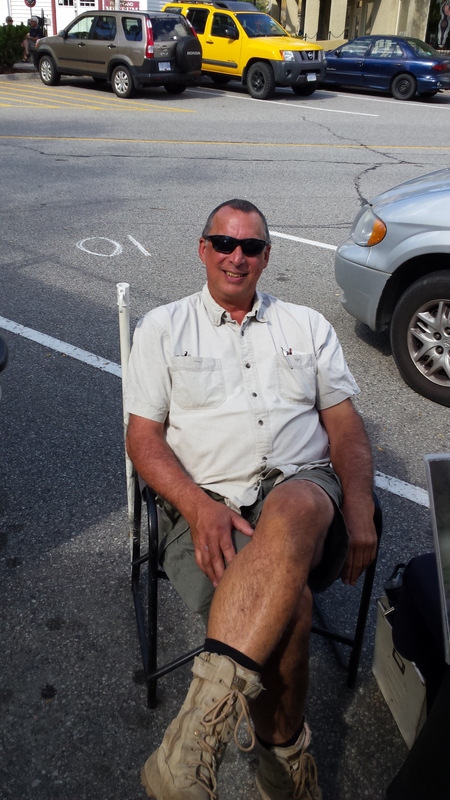 We also met John Whittall who resides in Westbank BC at the Peachland open market. I have always loved photos of nature and especially the fine work of this professional photographer. The gift cards that he has made with his beautiful photography are truly unique and stunning! We will be carrying his gift cards along with some great 8X10 photos. Thank you John for supporting our vision! We are so very pleased to have George and Rosemarie join us and have their beautiful studio creations in porcelain, Raku and stoneware clays showcased in our store. Fired to kiln temperatures from 1000 degrees to 1280 degrees creating beautiful colours and textures. A lasting treasure and wonderful gift to have. Keep an eye out as well for a few paintings created by George! Thank you George and Rosemarie for supporting Glenmore Gift Gallery! Rosemarie & George Greedy have been working together producing ceramic art pieces for over 40 years. 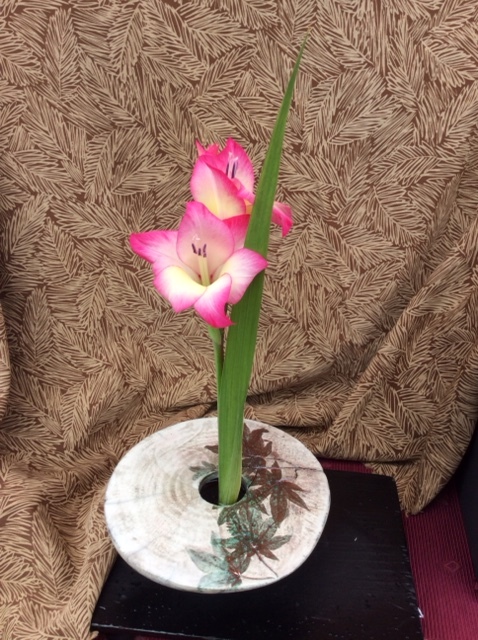 Both Rosemarie and George create works in Stoneware, Porcelain and Raku, and together they design and make one of a kind articles including Ikebana containers, Japanese stylistic masks, wall hangings, and feather and horsehair Raku pieces. Rosemarie’s skills on the wheel include the throwing of large rounded pots. Stretching the clay to its limit is both demanding and very exciting, leaving the rounded belly looking as though it will explode any minute. As well as regular glazing and kiln ﬁring technique, she also produces Raku ﬁred pots with both traditional and ferric chloride ﬁnishes. After working with clay for 40 plus years Rosemarie wanted to work on a smaller scale, making exquisite porcelain jewelry is now an addiction taking her on a new journey that is both challenging and exciting. Rosemarie prides herself on making most everything by hand including clasps and ﬁndings. George trained in all facets of art and he often uses the clay surfaces for graphic expression. His thrown and altered pots with incised drawings are examples of this. His multi-media masks and wall hangings have also become a recognizable theme. He also enjoys creating abstract paintings using acrylic to express his interest in the environment. They have exhibited their art in Germany, Switzerland, the U.S. and for the past 20 years in Canada. Their work is in art collections worldwide and includes publications in Ceramic Review and in the book ‘500 Raku’. With this wealth of experience behind George & Rosemarie you can be assured of having a piece of art work that will enhance your home or ofﬁce. PRESSED WISHES – THE ART OF PRESERVING NATURE…. is a family based Artisan business (established in 1999) that is located in the heart of the Okanagan – Mabel Lake, British Columbia, Canada. We combine a passion for nature, gardening and woodworking into creating unique pieces of affordable Canadian Handcrafted framed Art. The botanicals are grown on our 2 acre woodland gardens and also harvested from the surrounding mountain landscape. All the flowers, leaves, grasses and ferns are pressed and dried in a PRESSED WISHES traditional flower press. Many of our botanicals are also naturally colour enhanced to protect against fading. Thank you Melissa and James Puchinger for joining our great group of Artisans! 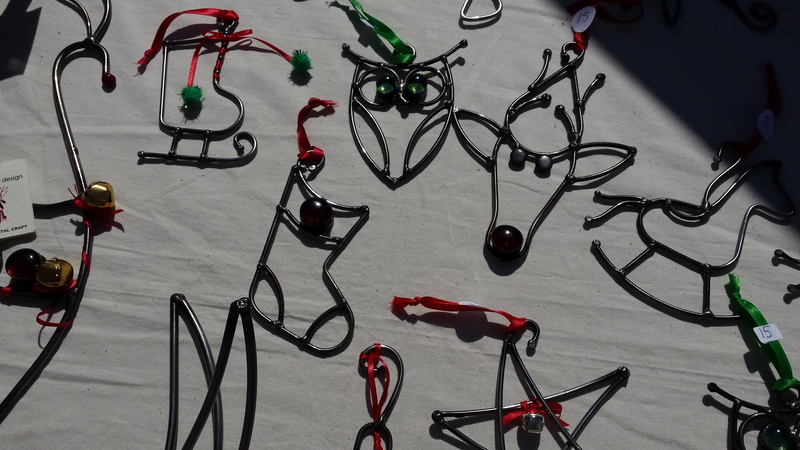 After seeing Maggies creative wire jewellery, we then understood why she called her work a labour of love. Her pieces do represent just that…. a labour of creative love in evey piece Maggie makes! But that’s not where the story ends!……When we met Maggie she was with her husband Vern Maschke who also has a creative talent of his own! Hence we also carry his line of handcrafted wooden toys that brought many happy memories back to me. 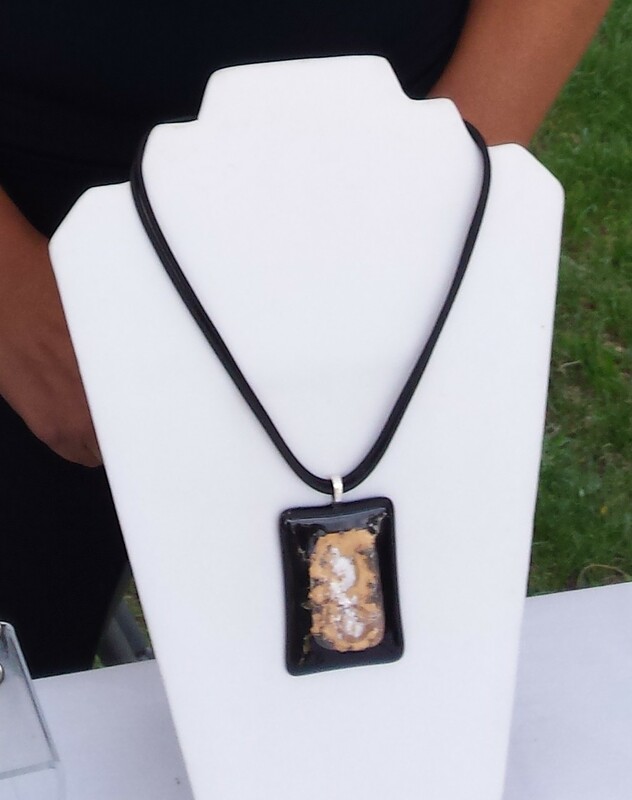 Hand made jewelry from a very talented artist! PBK ..Beaded Jewelry and Decorative fused Glass..
We met Irwin at a craft show in Penticton, this gentleman is truly an inspiration to all that meet him…for you see Irwin is almost totally blind and still continues to do what he loves to do..make beautifully crafted items from wood. And not only are they great works of art but are also functional pieces of work. Irwin is 86 yrs old going on 50…because seriously this man does not slow down! We are truly inspired by Irwin’s work and his positive outlook on life…we are honoured to have your work here in our store. Thank you Irwin!